Jessie Minton likes innovation, and the university’s chief information officer isn’t afraid to make a friendly competition out of it. 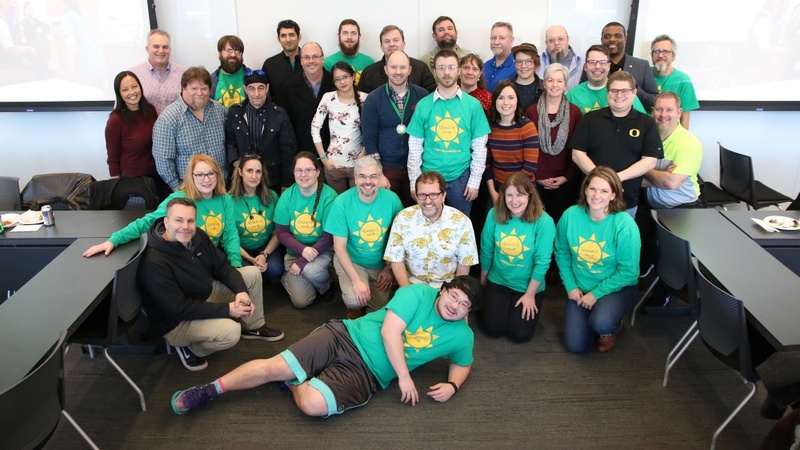 Eleven teams of UO information technology employees competed in the Quack-IT Challenge Dec. 12 and 13, the first 24-hour innovation challenge for university IT staff. Teams had 24 hours to develop their ideas and presentations on their projects. At the end of the 24-hour competition, each team presented their project to a panel of judges. Most deployable: Mark Messenger presented a solution for a web-based directory of UO webcams that also enhances the security of these internet-connected cameras. Best mission-facing solution: D.J. Wyrick, Lucas Crownover, Corey Gillen, Daniel Mundra and Garrett Stewart demonstrated a conceptual solution that provides accessible, persistent and scalable technology resources for data analysis, data persistence and other research-specific IT needs. Best return-on-investment: Brock Lampman, Kit Day, Meni Fontaine and Travis Shea developed a prototype of a new method for securely delivering business reports to users via OneDrive instead of email. People’s choice award: Dylan Bragg, John Fuller and Shane McGovern. This team won for their augmented reality mobile app that helps users identify trees on the UO campus. In addition to trees, the technology demonstrated by the team could be used for other purposes, such as campus tours that help visitors identify buildings, offices, artwork and more. Every Quack-IT Challenge project has been reviewed for how much work would be needed to implement the idea as well as its potential value to the university, regardless of whether it received an award. The competition featured one team comprised of IT student employees and another team of interns working in Information Services, along with nine teams of IT employees. The event was sponsored by Information Services. The next Quack-IT Challenge will be held in mid-December.